A second helping of this fabulous pattern! Handspun + Thorpe = BFFs. Yarn: Sock Hop Yarn, Crocodile Walk colorway, from Crown Mountain Farms. 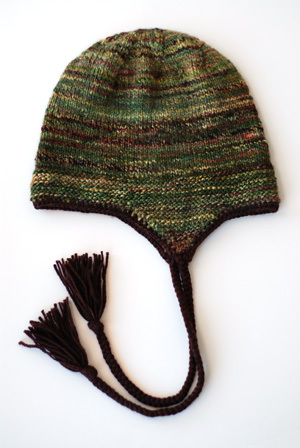 This hat used up approximately 65 grams and 170 yards of yarn. The contrast yarn is Malabrigo Sock, 100% superwash merino in Cordovan (810), held double. Needles and gauge: I used Susan Bates US 4 circular and double-pointed needles for a gauge of 6 stitches and 9 rounds per inch. If I understand correctly, Crown Mountain Farms employs a group of spinners to spin their Sock Hop yarns. Not surprisingly, the skeins vary depending on who did the spinning. I noticed right away that the two skeins of Crocodile Walk I purchased were different (the initials in the corner of the labels are “SB,” if that means anything to anyone). The yarn was a little bit thicker and fluffier, not at all over-spun, and just looked like someone without a worry in the world had made it :). By the way, if I ever take up spinning, I am destined to produce the world’s most over-spun yarn. I can just feel it. Anyway, the skeins of Crocodile Walk were noticeably fluffier than other Sock Hop yarns I’d used, and would not tolerate the typical US 2.5 (3.00 mm) tension. So I went up a needle size and treated it as a true sportweight. Worked out marvelously! Plus I absolutely love this colorway. As before, I had to modify the pattern for both a smaller size and thinner yarn. I increased until I had a total of 104 stitches, then knit straight stockinette for 4″. The finished hat is about 17″ around and 7.5″ from crown to where the earflaps start. Even though I was aiming for a 6-12 months size, I think this is closer to 2-year-old size. The fault is totally my own: I thought 17″ would work for a 6-12 month-old (instead it almost fit me!). But I decided to not frog once I realized my mistake – I trust that I’ll find a worthy recipient at some point ;). 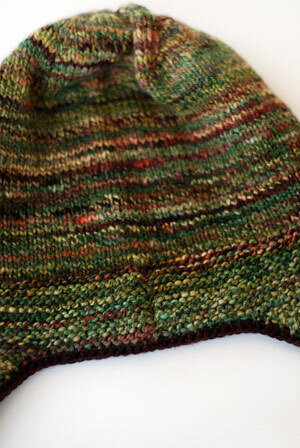 Oh, one last mod: I figured that knitting the garter stitch portion of the hat flat and then seaming would be just as visible/invisible as using Kathryn Ivy’s mods for a jogless join in garter stitch. I think I was right! Plus, no purling! So pretty! I love the Sock Hop yarn. That’s a great idea to do the garter section flat! You’d be surprised how much the death grip relaxes when you get into spinning. It’s really soothing that it just sort of lulls you into peacefulness. Thanks for the thoughtful comment on my blog recently, I’ve been meaning to reply, and coming up without words. I love the idea to seam the back like that! I just made a thorpe with the seamless jog method too, and am annoyed that you can tell 🙁 A visible seam on the back of a hat is no big compared to that. Very pretty yarn and hat! I love your knitting BFFs! 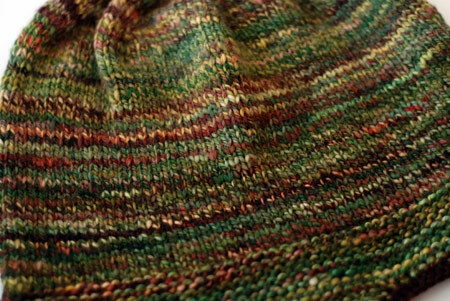 oh, I love the colors in this handspun too. Thanks for the reminder that this is the perfect handspun pattern! i’ve actually spun for them, and it’s quite the experience to have a full # of fiber show up at your door, and you get PAID to spin it! Enjoy the Crocodile Walk that remains! No purling, seriously it’s genius! I’m definitely doing this next time I knit this pattern. Thorpe is so awesome in handspun, I must learn to spin!